At the invitation of State Councilor and Foreign Minister Wang Yi, Minister for Foreign Affairs and Trade Promotion Carmelo Abela of Malta will pay an official visit to China from September 12 to 15. Q: According to reports, ROK President Moon Jae-in said that the peace of the Korean Peninsula should be promoted together with denuclearization and that now they are at an important juncture in building peace on the Peninsula. What is your comment? A: We attach importance to the relevant statement made by President Moon Jae-in. The essence of the Korean Peninsula issue is about security and the crux is the lack of mutual trust between relevant parties. Only when the relevant parties, especially the US and the DPRK as well as the ROK and the DPRK, address each other's security concerns in a balanced manner and establish mutual trust through dialogue and consultation can the Korean Peninsula nuclear issue be resolved in a fundamental way and the lasting peace of the Peninsula be achieved. 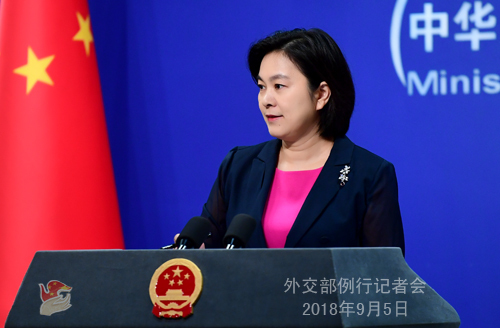 The Chinese side believes that the denuclearization and the establishment of a peace regime on the Korean Peninsula should be promoted in a coordinated fashion, which is completely consistent with the spirit of the Panmunjom Declaration and the outcomes of the DPRK-US summit in Singapore. We hope that all relevant parties can continue to enhance dialogue, further demonstrate goodwill and sincerity to each other and jointly make concrete efforts towards this right direction. Q: It is reported that the Nauru side has created much hassle for the Chinese delegation attending the 30th Pacific Islands Forum in that country. Could you talk a bit more about that? A: The 30th Pacific Islands Forum (PIF) Leaders Session with Forum Dialogue Partners was held on September 4 in Nauru, a country that has the so-called "diplomatic ties" with the Taiwan authorities. At the invitation of the PIF Secretariat, China attended the meeting as a Forum Dialogue Partner. However, the host country Nauru went against international practices and the PIF regulations and staged a despicable farce. Before the meeting, Nauru asked the Chinese delegation to travel on regular passports. After many PIF members and the Chinese side lodged representations and said that they would boycott the meeting, Nauru had to agree with the Chinese delegation's request to visit on diplomatic passports. 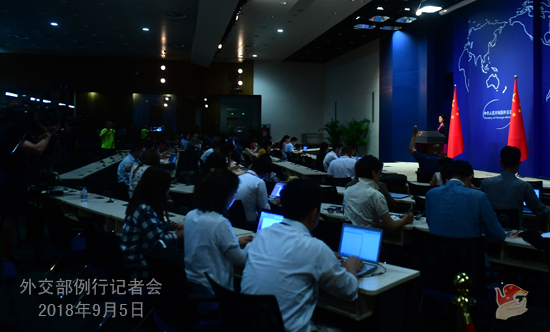 During the meeting, Nauru disrespected international practices again and obstructed the Chinese delegation's speech. The Chinese side immediately lodged stern representations and walked out of the meeting in protest. Many delegations from other attending countries also left the meeting to express their strong dissatisfaction with Nauru. It must be pointed out that the one-China principle is part of the well-recognized norms governing international relations and a consensus shared by the international community. Any attempt to create "two Chinas" or "one China, one Taiwan" will be rejected and is doomed to fail. Our advice for Nauru is that it should have a clear grasp of the overarching trend, correct its mistakes and stop working against the trend of the times. 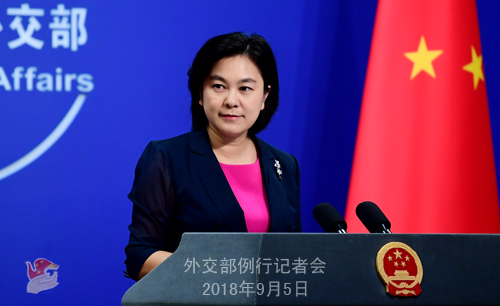 China attaches importance to its relations with the Pacific Islands countries and the PIF and will continue to strengthen friendly exchanges and practical cooperation with the Pacific Islands countries on the basis of the one-China principle. Follow-up: Nauru's President said yesterday that China is a big country trying to bully small countries. What is your response? A: Nauru is making a fuss out of nothing by accusing China of bullying small countries. What has happened these two days during the FOCAC Beijing Summit fully demonstrates again that China attaches greater importance to equality in international relations more than any other country. The relevant person should have understood that only those who behave with dignity will win respect from others. The same is true for a country. Big or small, one country should conduct itself with dignity and self-respect. Q: It is reported that the Philippine navy ship which ran aground in the vicinity of Banyue Jiao of Nansha Qundao was retrieved by the Philippine side on September 4. Can you confirm it and give us more details? A: The Chinese side is closely following the grounding of the Philippine navy ship BRP Gregorio del Pilar near Banyue Jiao of Nansha Qundao. We maintain close communication with the Philippine side in this regard. According to the information provided by the Chinese coastguard vessel which is on standby at the scene, the Philippine side retrieved the aground vessel and returned it to safe harbor on the early morning of September 4. According to our primary survey at the scene, we have not found oil slick or other consequences which may damage the environment caused by the grounding. After the vessel was stranded, the Philippine side immediately notified the Chinese side of the accident and the arrangement for search and rescue efforts. Our two sides discussed China's assisting in the search and rescue efforts. The Chinese coastguard vessel which is on standby in the relevant waters also maintain good interactions with the Philippine ships. The Philippine side expressed their thanks for China's goodwill. Q: Reports say that Arif Alvi, the presidential candidate from Pakistan's ruling party Tehrik-e-Insaf has been elected as the new President. What is your comment? A: The Chinese side congratulates Mr. Arif Alvi on being elected as the new President of Pakistan. President Xi Jinping has sent a message of congratulations to him. China highly values developing its friendly ties with Pakistan. We are willing to work with the Pakistani side to elevate the China-Pakistan all-weather strategic cooperative partnership to a higher level. Q: US Ambassador to UN Nikki Haley said yesterday that last week the UN attempted to issue a report on the implementation of the sanctions against the DPRK, but it was obstructed by Russia and China. Russia and China continue to create difficulties in the UN Security Council when it comes to resolving the Korean Peninsula nuclear issue. Do you have any comment on that? A: China has fully and strictly implemented relevant UN Security Council resolutions and fulfilled its international obligations. Meanwhile, we maintain that sanctions themselves are not an end, and actions taken by the Security Council should support and complement the current diplomatic efforts for dialogue and denuclearization of the Korean Peninsula and contribute to the political settlement process of the Peninsula issue. As for the annual midterm report by the Panel of Experts assisting the Democratic People's Republic of Korea (DPRK) Sanctions Committee, we believe it should objectively, comprehensively and accurately reflect the work undertaken by all countries to implement the Security Council resolutions. Its release should comply with the stipulations of the Security Council resolutions and the procedures of the Sanctions Committee. Groundless and irresponsible accusations will not help resolve the Peninsula nuclear issue. We hope the US could respect facts. Q: The International Department of the Central Committee of the Communist Party of China (CPC) released the information through Xinhua News Agency that Li Zhanshu, Chairman of the Standing Committee of the National People's Congress (NPC) will visit the DPRK and attend the celebrations marking the 70th anniversary of the founding of the DPRK on September 8. What are China's expectations for that? A: At the invitation of the Central Committee of the Workers' Party of Korea and the government of the Democratic People's Republic of Korea, Li Zhanshu, member of the Standing Committee of the Political Bureau of the CPC Central Committee and Chairman of the NPC Standing Committee, as General Secretary and President Xi Jinping's Special Representative, will head a Chinese delegation consisting of CPC and government officials to visit the DPRK and attend the celebrations marking the 70th anniversary of the founding of the DPRK on September 8. As friendly neighbors, China and the DPRK enjoy profound traditional friendship and have the tradition and practice of sending messages of congratulations to each other on the occasion of important festivals. Since this year, General Secretary of the CPC Central Committee and President Xi Jinping held three successful meetings with Chairman of the Workers' Party of Korea and Chairman of the State Affairs Commission of the DPRK Kim Jong Un in China, during which they reached important consensus on developing the China-DPRK ties in the new era. The China-DPRK friendship and the situation on the Korean Peninsula have achieved meaningful progress. We hope that our two sides, through this visit, can further promote the implementation of the consensus reached by the leaders of the two Parties and two states and have an in-depth exchange of views on issues of mutual interest. We believe that this will contribute to further cementing and developing China-DPRK traditional friendship and upholding regional peace and stability.